← Child marriage as ‘security’? The recent arrest and imprisonment of The Nation magazine editor, Bheki Makhubu and Thulani Maseko, a human rights lawyer and the magazine’s columnist for contempt of court, while shocking the world, has exposed the government’s malevolent desire to suppress freedom of expression and crash dissent. The two, who were arrested after publishing articles questioning the detention without trial of a government vehicle inspector, have subsequently been sentenced to an effective two years in prison. 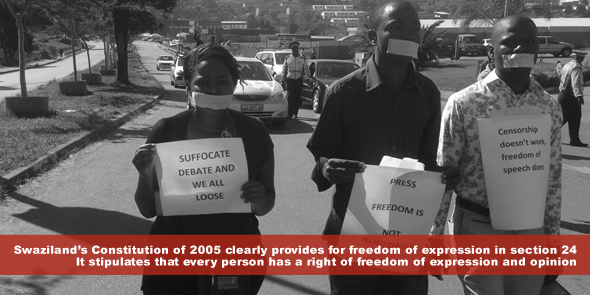 Swaziland’s Constitution of 2005 clearly provides for freedom of expression in section 24. It stipulates that every person has a right of freedom of expression and opinion. Harassment, torture, incarceration of journalists or any other attempts to suppress free speech is a violation of this constitutionally guaranteed right. The incarceration of the two is not an isolated incident but rather a highlight of the repressive regime’s longstanding intention to suppress freedom of expression. To understand Swaziland’s lack of freedom of expression it is important to look into the country’s media landscape. The government has maintained a tight grip on the media so as to control the information being disseminated while the few ‘independent’ media outlets have been constantly attacked leading to unprecedented levels of self-censorship. The systematic suppression of freedom of expression has not only been limited to the state’s control of the media but has also included intimidation, arrest and harassment of journalists and those who often criticise the government and/or the monarchy. The Nation magazine has been the most affected as it continuously questions government policies and decisions. The magazine has been dragged to court on numerous occasions on libel charges by government officials. Intimidation and harassment of journalists dates back to the turn of the millennium, when many in Swaziland became dissatisfied with the system of governance leading to the establishment of Swazi Independent Publishers in 1997, which owns The Nation magazine. With the motto ‘Speaking truth to power’ the magazine became increasingly critical of the government and the monarchy. In 2001 the government responded by instituting libel charges with the aim of shutting it down, but the decision went in favour of the magazine, much to the dismay of the government. This resulted in the targeting of journalists and commentators who criticise the monarchy and/or the government. It is in this context that the current crackdown on the magazine must be understood. The situation has been further exacerbated by the absence of political parties, which were banned under the 1973 decree. This has resulted in the media and trade unions being perceived as the opposition to the monarchy. The state views the media, especially The Nation magazine, as working in collaboration with banned political parties like People’s United Democratic Movement (PUDEMO). Journalists associated with or who write about banned political parties risk being arrested under the Suppression of Terrorism Act of 2008. The act defines terrorism in broad manner that makes nonsense of any organisation that challenges the status quo. The Sedition and Subversive Activities Act of 1936- inherited from the colonial regime- also continues to be used against media organisations and journalists that are critical of the King. These laws are a clear violation of Swazis’ constitutional right to freedom of expression. The continued use of these draconian laws serves to shield the government and the monarchy from scrutiny and criticism. It is also regrettable that the clampdown on freedom of expression has been extended to Parliament. Members of Parliament are not allowed to talk to the media on what happens during their sessions. In most instances, debates about controversial issues that affect ordinary people never find their way to the media. As representatives of the people, parliamentarians are supposed to give feedback to their constituencies. Denying them access to the media makes it extremely difficult to achieve this. Trade unions and civil society organisations (CSOs) also operate under a difficult environment in which they cannot criticise the government and the monarchy. The Trade Union Congress of Swaziland (TUCOSWA) was banned in 2012 for criticising government policies. The ban was lifted this year. Demonstrations organised by TUCOSWA are often blocked by the police and at times disrupted under the guise of maintaining public order. The hostile relationship that exists between the government and labour movements makes it impossible for unions to represent workers’ interests. Lack of media diversity combined with self-censorship practiced in all the newsrooms due to the culture of harassment, arrest and torture of journalists has rendered the constitutionally guaranteed right to freedom of expression non-existent in Swaziland. This in turn has resulted in systematic disinformation of citizens, making them incapable of holding the government accountable. Kudzani Ndlovu holds a Bachelor of Science (Honours) degree in Journalism and Media Studies from the National University of Science and Technology, Zimbabwe. He is an MPhil Candidate at the Centre for Human Rights, University of Pretoria, South Africa and currently interning with Katiba Institute, Nairobi, Kenya. Kudzani Ndlovu has also worked as a Research Assistant with Bulawayo Agenda in Zimbabwe. THANKS COMRADE: I DO NOT KNOW HOW BUT SWAZILAND NEEDS A SOLUTION ON THIS FOR SURE. Its Pathetic, legislatures should give feedback to the citizens.